Do you need a tax lawyer? 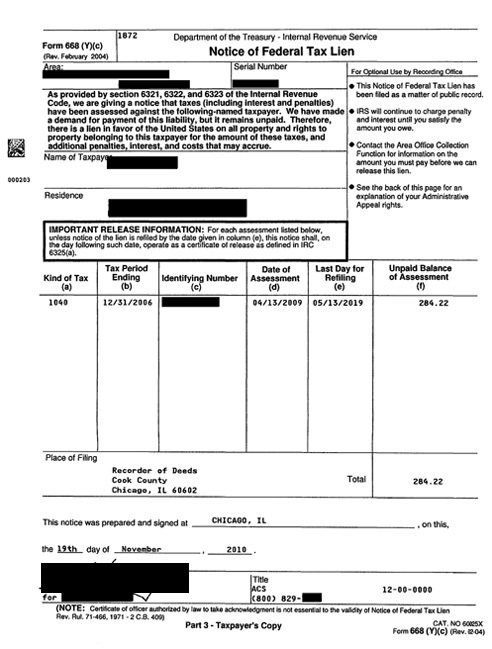 If you don’t think the IRS is going to come after you for a tax debt, just look at the notice below and see where the IRS is pursuing a taxpayer for only $284.22. Times are tough and the IRS is getting tougher. As provided by section 6321, 6322, and 6323 of the Internal Revenue been filed as a matter of public record. there is a lien in favor of the United States on all property and rights to amount you owe. on this, the 19th day of November 2010.
and to property you acquire after this lien is filed. filed the notice of lien. availc.ble at IRS offices, describes this proces~. are placed in escrow while the dispute is being resolved. donde este aviso de gravamen fue presentado.